A-MUSINGS » Blog Archive » Are You a Red Shirt Guy? I’m such a nerd and even took a quiz to prove it…as if my nerdiness needed validation. Worse yet, I’m a Star Trek nerd. I have faithfully watched Star Trek TOS (“The Original Series), TNG (“The Next Generation”), DS9 (“Deep Space Nine”), Voyager, Enterprise and all 11 movies. (I was prepared to loathe the 2009 cinematic prequel but found myself delighted with the casting.) However, I draw the line at the animated series. If I were a Star Trek character, I would probably be a Spock-like science officer clad in, of course, blue. Trekkies and Trekkers alike know the classic uniform colors are gold for Command personnel, blue for Science staff, and red for Operations, Security, and Nameless Dead Guys. Yes. There, I said it. The tragic Red Shirt Guy. Remember him? Every landing party or “Away Team” beaming down to a mysterious planet would include a guy wearing a red uniform shirt who inevitably got killed in some fantabulous way before the first commercial break. Even my favorite sci-fi comedy Galaxy Quest, which satirized space-themed TV shows, featured “Crewman #6,” a red-shirted ensign who feared for his life because his character didn’t have a last name. The Red Shirt Guy was the throw-away character who had no purpose in life except to perish at the hands (or sepals) of a poisonous pod plant, the Gorn, or a nebulous dikironium cloud creature. He was expendable. But why? Surely he had a mother and father on Earth or some Class M planet. He had dreams and desires just like everyone else. He put on his little black capri pants one leg at a time. Maybe, he was just too much of a wallflower. He was content to sit back complacently and merely do what he was told. Never taking initiative. Never going that extra mile. Are you a Red Shirt Guy? Do you sit idly by, missing countless opportunities, moving through life as a subservient automaton? Hoping you don’t get picked for the Landing Party? Maybe it’s time to change your shirt. Don’t let the world label you because of the shirt you wear, the job you have (or don’t have), or the company you keep. We all have worth. Show it. Make a difference in someone’s life, and you’ll never be expendable. “How do I do that?” you ask. Contribute. We have a Help Jar in our family. Loose change we find on the street and in between couch cushions goes into the jar. At the end of the year (or whenever the jar is full), I let my children decide which charity should receive the cash donation. But even more important than giving money is giving your time. Volunteer (just not for an Away Team)…on a regular basis if you can, or as much as possible. You can always find someone who will welcome free help. It doesn’t even have to be a charity. Look around. Lend a hand to your neighbors. Make a connection with others. Find something you’re passionate about, and teach it to someone. Foster a puppy or kitten, or if you’re up for it, a child. Or just be a better person, parent, friend, son or daughter, sibling. Give a hug to someone who needs it. Be kind to people…even strangers. They will appreciate and see your value. 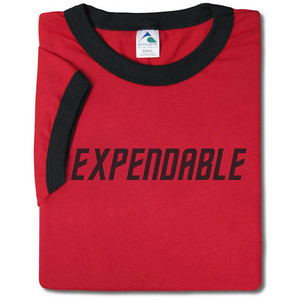 You’ll never be expendable again.